The needle-free drug delivery system. The Winkku is designed to improve cycle safety through increased spatial awareness and user control. 3D CAD plays a large role in most design development projects. It allows for the every part to be fully realised, analysed, and assessed. 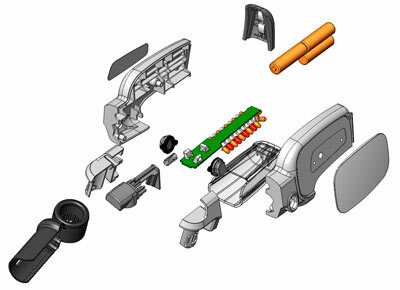 The 3D CAD model also provides crucial data for prototyping and manufacture. Brightworks are expert users of SolidWorks; a 3D CAD program that enables to us to create complex geometrical forms in a fast and cost effective manner.